What do these fruits have in common? Once sliced, they begin to discolor quickly. 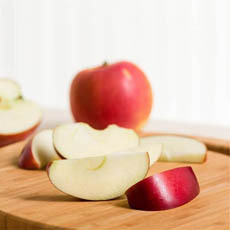 Sliced apples (photo courtesy US Apple Association). 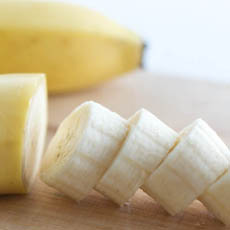 Sliced banana (photo courtesy Baby-Recipes.com). 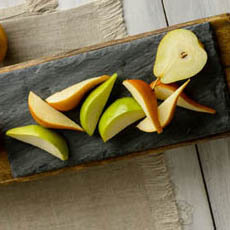 Sliced pears (photo courtesy USA Pears). 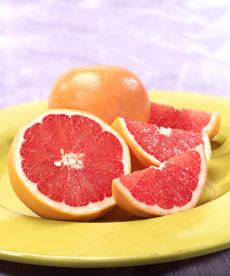 Squeezing citrus juice on cut fruit is just one of 6 techniques (photo courtesy Texasweet). Now that we’re into the cooler months and stone fruit and blueberry seasons are over, many people turn to apples, bananas and pears. You can eat them whole as hand fruit; or slice them to use them as garnishes, in fruit salads, etc. Or, you may be slicing them to prepare a pie or tart. But how do you stop them from turning brown? Browning of fruit is caused by the exposure of the flesh to oxygen. Enzymes in certain fruits react quickly with the oxygen in the air to oxidize, which turns the flesh brown. The discoloration doesn’t effect taste, but appearance. The solution is to limit that exposure. Anyone who has read a pie recipe knows to coat the cut surfaces with lemon juice, the strongest edible acid that can stop the enzyme reaction. This may be the best technique, but there are other techniques as well. A half cup of juice will sufficiently cover two apples, bananas or pears. We brush the juice onto the sliced fruit with a pastry brush; a friend uses a small spray bottle (the travel-size used for cosmetics). You can also toss or immerse the fruit in the juice for a few minutes; but when they soak up the juice, they also soak up the flavor. If you don’t want tart flavor from lemon or lime juice, e.g., you can add some sugar. Once they’re coated in fruit juice, the slices will take much longer to turn brown. They will last without refrigeration in a plastic container for a few hours, but are best consumed the same day. The way to stop apples, bananas and pears in fruit salads from browning is to mix them with high-acid fruits: grapefruit, mandarins and oranges (the difference), pineapples, tangerines. Save the juices from slicing these fruits and add them to the bowl. They’ll stop the sensitive from browning. Lay the cut fruit on a plate or tray. Cut a piece of plastic wrap or wax paper to cover, and press it over the top of the slices, creating a shield from the air. This works best when the slices are roughly the same size. If you have a vacuum storage system—whether a heat-sealing system like InLife or hard a vacuum pump like Food Saver, you can create an air-free storage bag. A hack is to put the slices in a storage bag and squeeze out the air. Refrigerate until ready to use. If you have a bit of lemon juice to sprinkle in, so much the better. As a last resort, use club soda, seltzer water, soda water (the differences), or just plain water. Flavored waters can even add a hint of extra flavor. Soak the slices in the water/club soda. They don’t add flavor, so you can keep them in a lidded container until ready to use. Apples, bananas and other quick-to-brown fruits can also be coated with mayonnaise or salad dressing. These coatings block out the oxygen, which will also stop the browning process. If you’re making this type of recipe, you’re covered. Citric acid is the chemical in citrus juices that keeps cut fruits from browning (and also makes the fruit taste sour). It is sold in a purified form as a canning additive, to keep the cut fruits in the cans or jars from discoloring. Check at a health food store or a hardware store. However, we mention this as an FYI. It’s easier for home kitchens to use any of the above. Powdered vitamin C, used as a cold-fighting supplement, is a similar option. Dissolve it in water according to the package directions, and soak the fruit. You can also grind up a vitamin C tablet. WHAT IF SLICED FRUIT HAS TURNED BROWN? Help is at hand: Immerse the discolored fruit slices in pineapple or grapefruit juice for 10-15 minutes. They won’t return to their pristine whiteness, but will lighten and look fresher.